...Shinkansen, the Japanese network of fast express trains which means that it's possible to travel from one end of Honshu (the main island) to the other in a day. They are never late and run exactly on time so if, as ours was, the Hikari 10.19 to Fukushima, it will arrive at the platform at 10.16 and depart precisely on time. Travelling on the Shinkansen is one of the experiences of Japan that shouldn't be missed as it's rather like flying at ground level but with a lot more space and without the interminable bloody waiting at airports...I'm quite convinced that if stubby wings extended from the carriages, at 180mph it would start to take-off! The train pulls into the platform with a scant 100mm to spare and stops exactly, almost to the centimetre, at it's designated point. The pic below shows the platform markings which correspond to the those on the carriages. Note also the immaculately turned out young lady ready to assist you to your seat if needed. 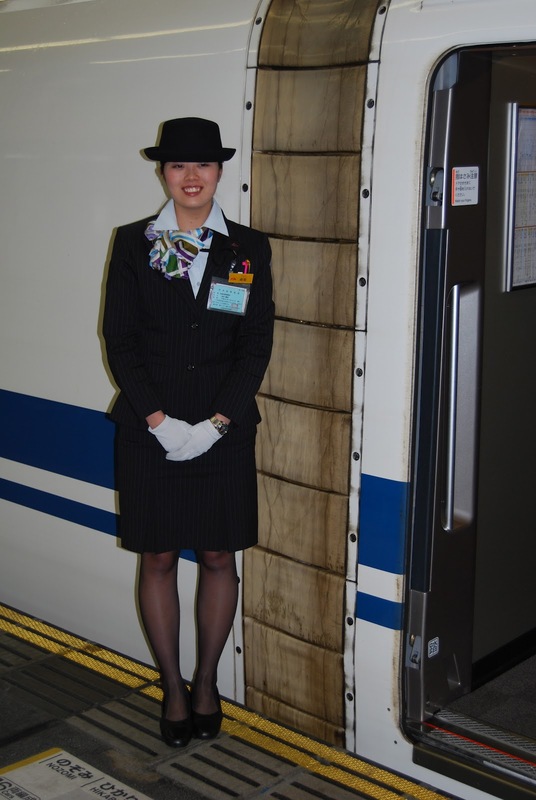 That she looks like an airline stewardess is no co-incidence and in point of fact, all JR staff were similarly attired. ...a small army of cleaners (complete with white gloves) descends on the train. One of the things they do is to depress the lever on the seat (shown above)...and the complete thing turns through 180deg! Having found your reserved seat, the train will very shortly start rolling. My estimation is that by the time the last carriage has cleared the platform, it's moving at around 60mph! If seats aren't reserved, your ticket has to be stamped (there's a surprise!) 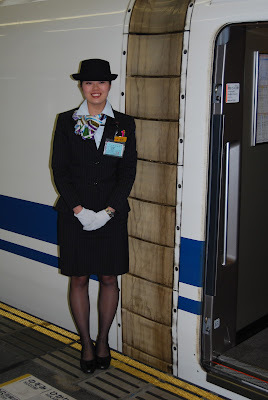 by the inspector, who enters at one end, stands to attention, removes his peaked cap...and then bows deeply to the entire carriage before moving down it. 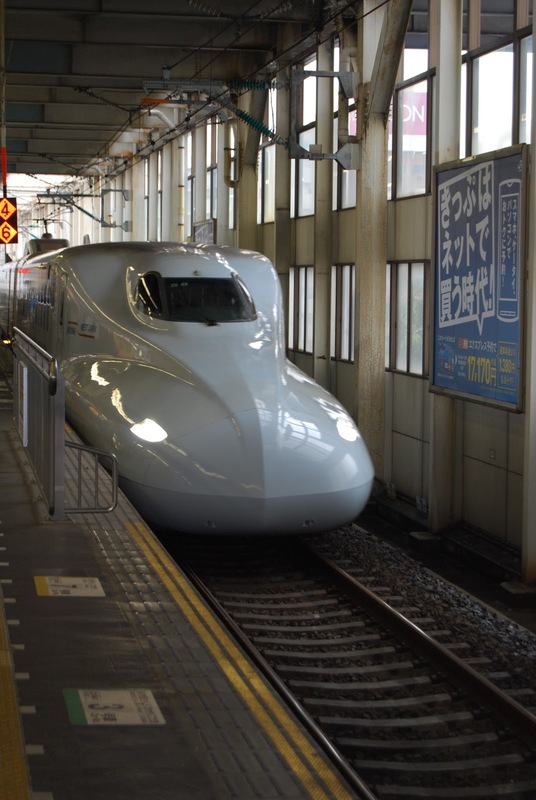 "This..is..the..Shinkansen..suuuper.. express..bound..for..Toyko. We..will..be..making..short..stops..at.. Fukuyama..Okayama..Himeji.." etc etc. ...shown above, and will even use them riding on a bike. Physically, the Japanese tend to be a small race of people, but if you look carefully at the cycle in the first picture, it's typical of those found everywhere. High handlebars with the saddle set at the lowest possible point. Now I know the Japanese are small, but anyone of any reasonable height is going to get on one of those bikes and smack themselves on the chin with their knees each time the pedals go round! I worked for a Japanese manufacturer during the 80s and 90s and was a regular visitor. In those days, you flew via Anchorage if you wanted to do it in one hit. 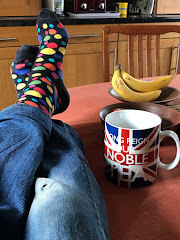 But you definitely needed a sense of the ridiculous; I recall – though sadly un-photographed at the time – a Japanese gentleman in a hotel in Fuji City eat a fried egg, done sunny-side-up, with chopsticks.